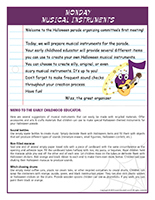 Everything you need to plan and create musical instruments, accessories, costumes, and invitations for a perfect Halloween parade. 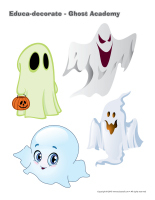 Halloween crafts, a songbook, decorations, activity sheets, coloring pages, and so much more! 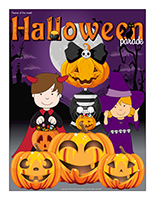 (Open thematic poster-Halloween parade) Print, laminate, and display all kinds of posters. (Open educa-decorate-Ghost Academy) Print, laminate, and cut out the various items. Use them to decorate your daycare and set the mood for the theme. 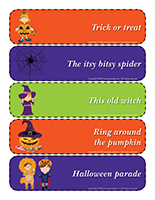 (Open educa-theme-Halloween parade) Print and laminate the items that represent the theme. Use them to present your theme to the children in your group (and their parents) and decorate your daycare. This special tool was created in response to a special request received. (Open poster-Turn back your clocks) Print, laminate, and display. 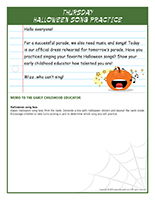 (Open activity sheets-Halloween parade) Print and follow instructions. 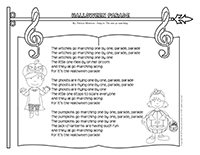 (Open writing activities-P like parade) Print for each child or laminate for use with a dry-erase marker. 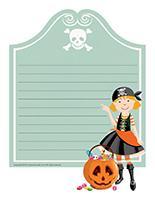 (Open stationery-Halloween parade) Print. Use the stationery to communicate with parents, in your writing corner, or to identify your thematic bins. 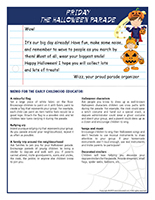 (Open educa-nuudles-Halloween parade) Print for each child. Have children color the sheet. Once they are done, they may use Magic Nuudles to turn the coloring pages into three dimensional works of art. Variation: If you do not have Magic Nuudles, ask children to fill the spaces designed for the Magic Nuudles with bingo markers or stickers. 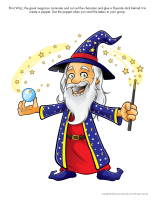 To order Magic Nuudles. This week, the educatall team suggests you prepare a thematic activity-filled week. You can follow the steps throughout the week to have fun organizing a Halloween parade with Wizz, the great parade organizer and magician. (Open thematic letters-Halloween parade) Print and deposit the letters in an envelope, a box, or a special Halloween mailbox each morning. A large magician or sorcerer hat. A magic box filled with glitter (you can hide the envelope with glitter). A large pot filled with sticky substances (for example a mixture of cooked pasta and dishwashing liquid). Of course, if you select this option, you will have to place your envelope in an airtight container. A large envelope with ghost-shaped prints on it. A large box decorated by your group using Halloween-related items and colors. Throughout the week, the great parade organizer will invite children to take part in different activities to prepare for the Halloween parade that will take place at the end of the week. From music to costumes, not a detail will be forgotten and everything will be perfectly planned with help from Wizz and the children in your group. Of course, a successful Halloween parade will also require their early childhood educator's precious collaboration. Welcome to the Halloween parade organizing committee. Let me introduce myself. My name is Wizz. I am a magician with great parade organization powers. I am very happy that you wish to be a part of my organizing committee for the upcoming Halloween parade. Your help is necessary for the parade to be a success. Your early childhood educator will help you every step of the way. Listen closely to the instructions she will read to you each day. Welcome to the Halloween parade organizing committee's first meeting! Today, we will prepare musical instruments for the parade. 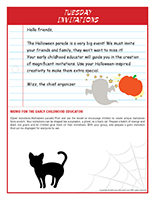 Your early childhood educator will provide several different items you can use to create your own Halloween musical instruments. You can choose to create silly, original, or even scary musical instruments. It's up to you! Don't forget to make frequent sound checks throughout your creation process. Have fun! Memo to the early childhood educator: Here are several suggestions of musical instruments that can easily be made with recycled materials. Offer accessories and arts & crafts materials that children can use to make special Halloween-themed instruments for your Halloween parade. Use empty water bottles to create music. Simply decorate them with Halloween items and fill them with objects that will produce different types of sounds (miniature erasers, small figurines, Halloween confetti, etc.). Seal one end of several empty paper towel rolls with a piece of cardboard with the same circumference as the opening and adhesive tape. Fill the cardboard tubes halfway with rice, dry pasta, or legumes. Have children hold the maracas while you seal off the other end of each one. Let children draw on the tubes or decorate them with Halloween stickers. Add orange and black ribbon to each end to make them even more festive. Children will love shaking their Halloween maracas to produce sounds. Use empty metal coffee cans, plastic ice cream tubs, or other recycled containers to create drums. Children can wrap the containers with orange, purple, green, and black construction paper. They can also stick plastic spiders or Halloween stickers on the drums. Provide wooden spoons children can use as drumsticks. If you wish, you can paint them black or orange. The Halloween parade is a very big event! We must invite your friends and family, they won't want to miss it! Your early childhood educator will guide you in the creation of magnificent invitations. Use your Halloween-inspired creativity to make them extra special. 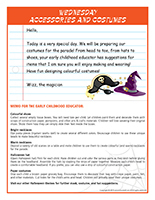 Memo for the early childhood educator: (Open invitations-Halloween parade) Print and use the model or encourage children to create unique invitations from scratch. Your invitations can be shaped like a pumpkin, a ghost, or a black cat. Prepare a batch of orange and black rice grains and let children glue them on their invitations. With your group, also prepare a giant invitation that can be displayed for everyone to see. Today is a very special day. We will be preparing our costumes for the parade! From head to toe, from hats to shoes, your early childhood educator has suggestions for items that I am sure you will enjoy making and wearing! Have fun designing colourful costumes! Collect several empty tissue boxes. You will need two per child. Let children paint them and decorate them with scraps of construction paper, pompoms, and other arts & crafts materials. Children will love wearing their original shoes. Show them how they can simply slide their feet inside the boxes. Dye pasta pieces (rigatoni works well) to create several different colors. Encourage children to use these unique beads to make beautiful necklaces. Deposit a variety of old scarves on a table and invite children to use them to create colourful (and warm) necklaces for the parade. (Open Halloween hat) Print for each child. Have children cut and color the various parts as they wish before gluing them on the headband. Assemble the hats by stapling the strips of paper together. Measure each child's head to create a comfortable headband. If you prefer, you can also use a strip of colourful construction paper. Give each child a brown paper grocery bag. Encourage them to decorate their bag with crepe paper, paint, felt, and other materials. Cut holes for the child's arms and head. Children will proudly wear their unique costumes. 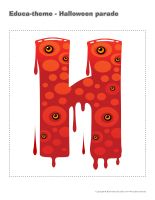 Visit our other Halloween themes for further mask, costume, and hat suggestions. For a successful parade, we also need music and songs! Today is our official dress rehearsal for tomorrow's parade. Have you practiced singing your favorite Halloween songs? Show your early childhood educator how talented you are! (Open Halloween song box) Print the cards. Decorate a box with Halloween stickers and deposit the cards inside. Encourage children to take turns picking a card to determine which song you will practice. Wow! It's our big day already! Have fun, make some noise, and remember to wave to people as you march by them! Most of all, wear your biggest smile! Happy Halloween! I hope you will collect lots and lots of treats! Set a large piece of white fabric on the floor. Encourage children to paint on it with fabric paint to create a flag that represents your group. For example, each child can paint an item he/she feels would be a good logo. Attach the flag to a wooden stick and let children take turns carrying it during the parade. Invent a unique rallying cry that represents your group. As you parade around your neighbourhood, repeat it as often as possible. Ask families to join you for your Halloween parade. Encourage parents of young children to bring a stroller to daycare and walk with you. If parents cannot attend, invite grandparents, aunts and uncles, the cook, the janitor, or anyone else children know to join you. Ask people you know to dress up as well-known Halloween characters children can cross paths with during the parade. For example, the cook could wear a witch costume and hand out a special snack, a daycare administrator could wear a ghost costume and direct your group, and a parent could dress up as a clown and encourage children to sing. Encourage children to sing their Halloween songs and don't hesitate to use musical instruments to draw attention to your group. If your homemade instruments aren't loud enough, use real instruments and invite parents to participate! Children will love helping you decorate your daycare strollers for the parade. Provide streamers, small flags, spider webs, balloons, etc. (Open frame-Halloween parade) Print for each child. 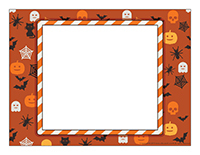 Insert a group or individual photo taken during your Halloween parade in each child's frame. Laminate each child's frame for a souvenir that will be cherished for years to come. 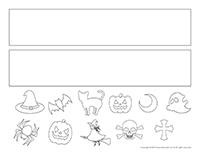 (Open coloring pages theme-Halloween parade) Print for each child.